Activation: Activation in chemical sciences generally refers to the process whereby something is prepared or excited for a subsequent reaction. Activation energy: In chemistry and physics, activation energy is the energy which must be provided to a chemical or nuclear system with potential reactants to result in: a chemical reaction, nuclear reaction, or various other physical phenomena.The activation energy of a reaction is measured in joules (J) and or kilojoules per mole (kJ/mol) or kilocalories per mole (kcal/mol).Activation energy can be thought of as the magnitude of the potential barrier (sometimes called the energy barrier) separating minima of the potential energy surface pertaining to the initial and final thermodynamic state. For a chemical reaction, or division to proceed at a reasonable rate, the temperature of the system should be high enough such that there exists an appreciable number of molecules with translational energy equal to or greater than the activation energy. 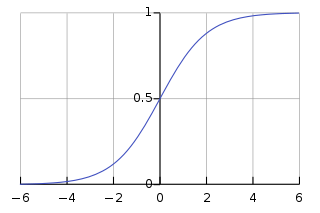 Activation function: In artificial neural networks, the activation function of a node defines the output of that node, or "neuron," given an input or set of inputs. This output is then used as input for the next node and so on until a desired solution to the original problem is found.It maps the resulting values into the desired range such as between 0 to 1 or -1 to 1 etc. Activation-induced cytidine deaminase: Activation-induced cytidine deaminase, also known as AICDA and AID, is a 24 kDa enzyme which in humans is encoded by the AICDA gene. It creates mutations in DNA by deamination of cytosine base, which turns it into uracil . Activation product: Activation products are materials made radioactive by neutron activation. Fission products and actinides produced by neutron absorption of nuclear fuel itself are normally referred to by those specific names, and activation product reserved for products of neutron capture by other materials, such as structural components of the nuclear reactor or nuclear bomb, the reactor coolant, control rods or other neutron poisons, or materials in the environment.